Hello everyone, hope you’re all doing well this holiday season. Happy Holidays to those celebrating at this time of year and if there aren’t any holidays you’re celebrating, well, just hope you’re doing well and having a nice day! 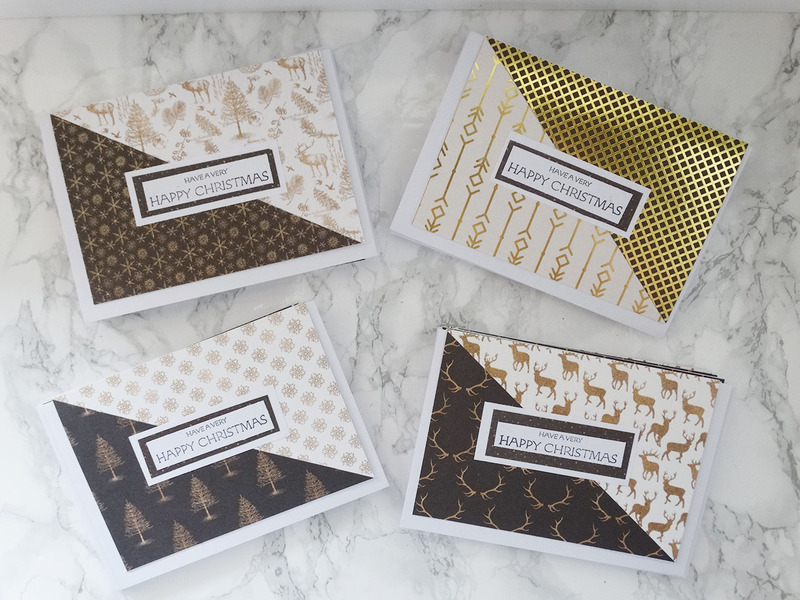 Today’s post is a little short but I just thought I’d show you the Christmas cards I made this year that I send out to family and friends (which have all hopefully arrived by now!). My cards are pretty simple this year because I was in quite a rush to get them made so I could actually send them out in time. I actually bought a different paper pack that I intended to use for my cards but then I forgot about it and ended up using this paper pad that I bought last year instead. Well, I guess that other paper pack can just be used for next year instead! In terms of design, I also kept things very simple for the cards. I cut the paper down into triangles and paired some patterns together with the sentiment on top. Not my most elaborate of cards but I think they at least look good and classy! Gorgeous – they are very sophisticated looking! You have incredible abilities!! They are so beautiful and classy looking!! My favorite are the last two! !